From the expeditions of de Soto in the sixteenth century to the celebrated work of such contemporary poets and prose writers as Maya Angelou and Ellen Gilchrist, Arkansas has enjoyed a rich history of letters. These voices have been, and still are, as various as the state's geography -- the Delta, the Arkansas River Valley, the Ouachita Mountains, and the Ozark Plateau. 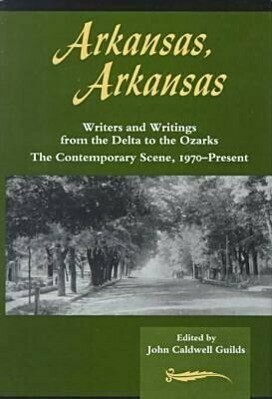 Available in two volumes, this anthology of writers from various genres -- journals, travel writing, biography, history, poetry, fiction -- reflects the state's unity as well as its sometimes extreme cultural, political, and topographical differences.The writers represented here are primarily Arkansans writing about Arkansas. Writers who are not natives or residents but who, nevertheless, have written about the state are included as well, as are those who have strong connections with the state but whose work does not.Volume 1 covers the exploration of Arkansas and its rise to territory and statehood. It culminates in a generous selection of writers, including James R. Masterson, Henry Dumas, Thomas Bangs Thorpe, and John Gould Fletcher, all of whom contributed to Arkansas's reputation as a literary state after the Civil War.Volume 2 includes poets and prose writers as diverse as C. Vann Woodward, C. D. Wright, Leon Stokesbury, Barry Hannah, J. William Fulbright, and John Clellon Holmes. It is a model for the proliferation of talent that has sprung up in the last twenty-five years. The two volumes gather, in a single collection, the best work from Arkansas's rich literary history, celebrating the variety of its voices and the national treasure those voices have become.